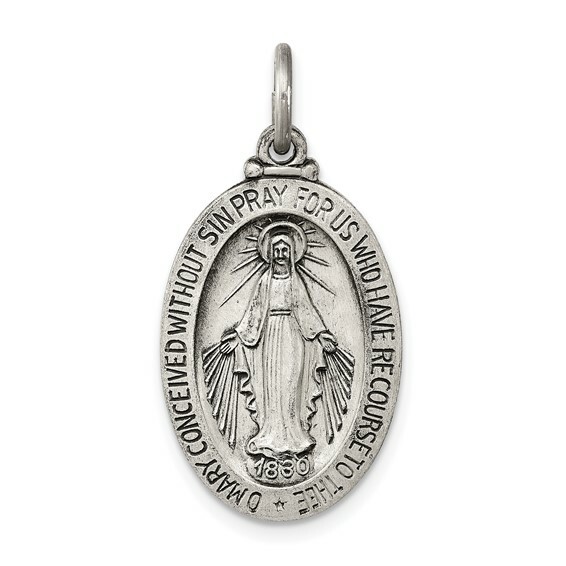 This oval miraculous medal is made of antiqued solid sterling silver. Weight: 2.14 grams. Measures 7/8 inch tall by 9/16 inch wide without bail. This item is the size of a nickel. Chain not included. Made in USA. Perfect size and weight. Very lovely. These medals were just as pictured and came very nicely presented in a jewelers box, a very nice touch. Thank you. One of these was for a gift and this was a pleasant surprise. An all around great experience. Very disappointed. I returned. Paid shipping both ways and a $5.00 restock fee. Ridiculous. For my slight 7 year old grandson. This one is classic and you can choose the size, which is important. Good quality and it slipped onto my chain nicely. I am very satisfied and will order again. I was looking for a Miraculous Medal to wear with my crucifix. I should have gotten one a bit smaller, but I love it just the same.